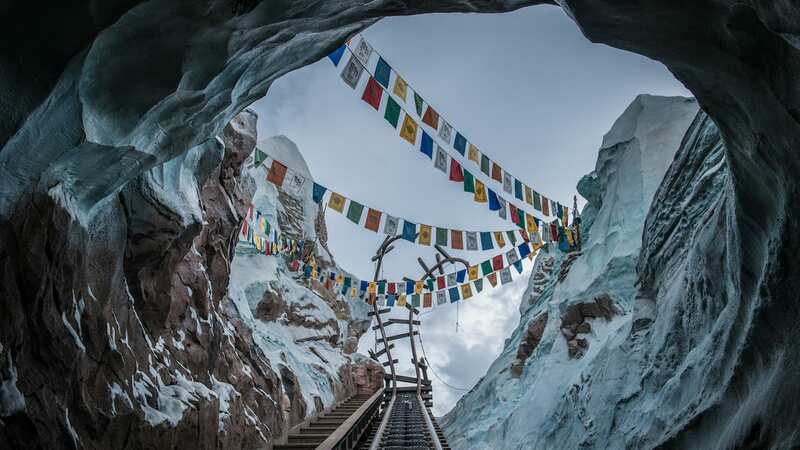 Spring has sprung at Walt Disney World Resort, and if you stop to smell the flowers, you might just smell some new snacks being cooked up at Magic Kingdom Park! There’s an enchanting array of new offerings now available and even more coming soon. Perfect for the season, we’ve got a brand-new Flower Crown Cupcake available at Main Street Bakery. This beautiful vanilla cupcake is filled with raspberry buttercream and topped with a buttercream flower crown and hard candy Minnie Ears. This yummy treat is the perfect spring snack, and even makes for a good photo opportunity. 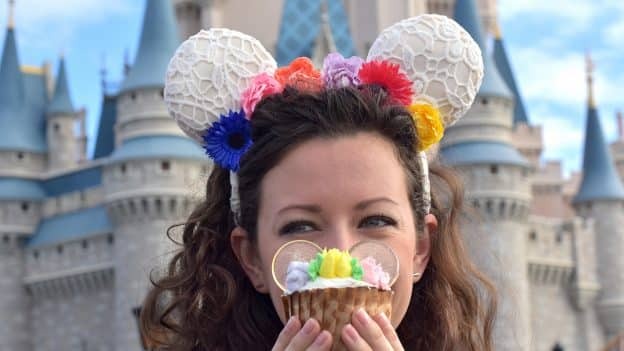 Just grab some Crochet Floral Minnie Ears from your favorite Disney shop and pose for the camera with your flowery cupcake in hand! 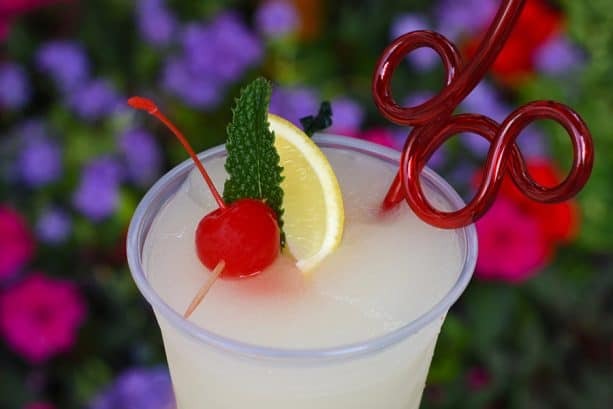 Just across the street at Casey’s Corner, you’ll find a brand-new refreshing beverage – a Mint Julep Lemonade Slushy! This non-alcoholic lemonade slushy comes with mojito-flavored syrup, and a garnish of cherry, mint and lemon wedge. And we can’t forget about the popular Hot Dog of the Month. While there’s only a few days left in March, don’t miss your chance to try the Greek Hot Diggity Dog! And for April’s Hot Dog of the Month, you’ll find the Cuban Hot Diggity Dog, topped with Mojo pork, relish, swiss, and mustard. These special “of the month” toppings can even be added to an order of fries! At Plaza Ice Cream Parlor, March’s Ice Cream of the Month is Dulce De Leche, and April’s flavor will be Cookie Dough – yummy! But the ice cream doesn’t stop there – a Brownie Sundae and an Apple Blossom Sundae have also been added to the menu! Right next door at The Plaza Restaurant, you’ll find March’s Milkshake of the Month: Coffee Mint – with mint chocolate ice cream, coffee, chocolate sauce, whipped cream and a cherry. And for April, the Milkshake of the Month will be a Caramel Turtle Milkshake with vanilla ice cream, hot fudge, caramel sauce, and walnuts. In Fantasyland, Pinocchio Village Haus has added an Italian Cream Cake to the dessert menu. This lemon cakes comes topped with cream cheese icing, toasted coconut and a white chocolate piece featuring everyone’s favorite Conscience – Jiminy Cricket! As for the Flatbread of the Month – March’s flatbread is Buffalo Chicken. And since April is National Grilled Cheese Month, the April Flatbread of the Month will be a Grilled Cheese Flatbread with ricotta, mozzarella, Parmesan, swiss, and cheddar and served with a side of tomato-basil soup for dipping! At Be Our Guest Restaurant, I recently posted about an exciting new dinner menu coming this summer, and I now have the scoop on the fabulous dessert trio. This trio will have a raspberry macaron with lemon filling and fresh raspberries, a whole Amarena cherry dipped in dark chocolate with hazelnut topping, and a white chocolate Chip cup with our signature Grey Stuff! It will also be exclusive to the dinner menu. At Gaston’s Tavern, you’ll find a new Ham, Brie, and Grain Mustard Sandwich as well as a Smoked Turkey, Swiss and Cranberry Aïoli Sandwich. 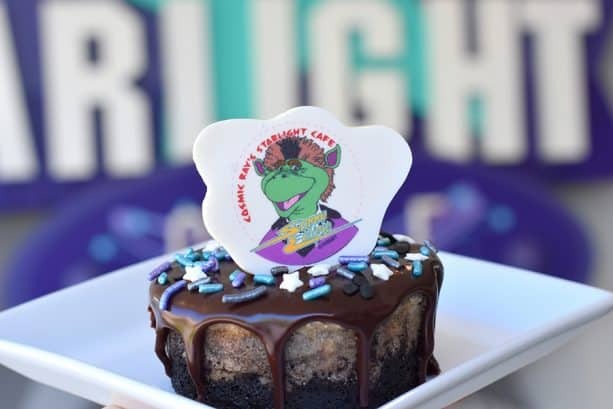 In Tomorrowland, Sonny Eclipse has a new dessert at Cosmic Ray’s Starlight Café – a cookies & cream cheese cake topped with chocolate, galaxy sprinkles, and a white-chocolate piece featuring the amazingly-talented Sonny Eclipse himself. And over at Liberty Square, you’ll find a crisp new Shrimp Wedge Salad at Columbia Harbour House. And finally, in Adventureland, I’ve got a fruit-tastic update to the menu at Sunshine Tree Terrace. 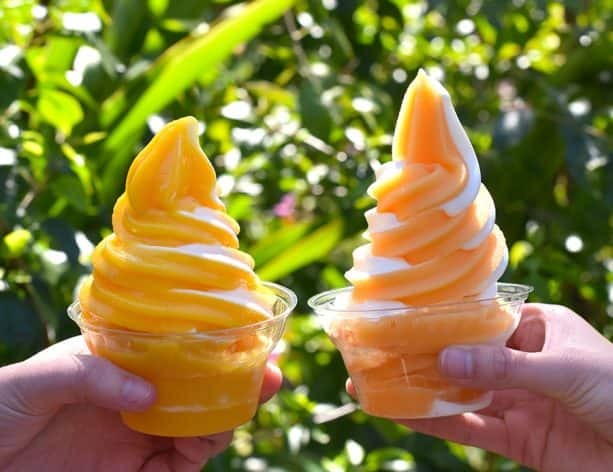 Our famous Citrus Swirl, the classic frozen orange juice slushy twisted with vanilla soft-serve ice cream, has been joined by the new Orange Cream swirl! This new swirl twists together vanilla soft-serve ice cream with Orange Dole® Soft-Serve to create a tasty new citrus-flavored treat. Both of these swirls are now available in a cup or as a float with refreshing orange soda. So there you have it. 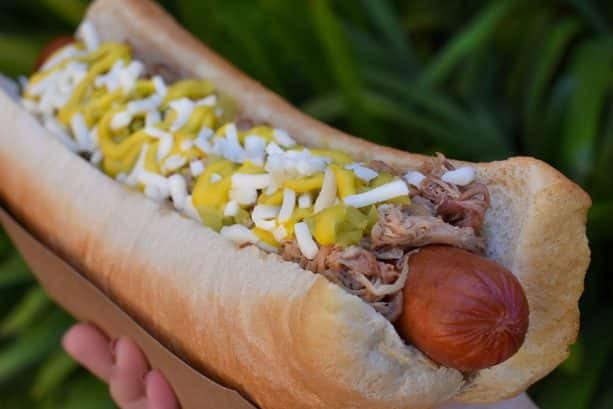 Magic Kingdom Park is buzzing with tasty excitement this spring, so come on out and try all of these delicious new offerings! 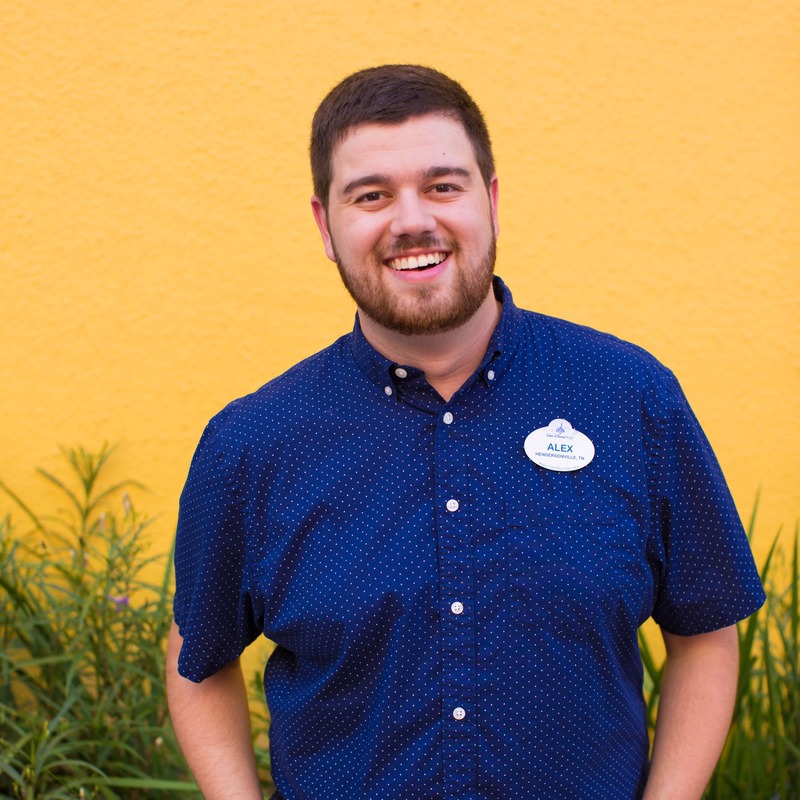 I absolutely love Citrus Swirl & was scared when I saw this post!! I thought a change was coming for the Classic with frozen o.j.!!! It is the perfect blend of tart and sweet. Nice and icey, not too creamy. Sheer perfection. Thanks for keeping the original too! Thanks so much for providing a vegan orange swirl option. Are there any vegan alternatives for the other new items you mentioned? 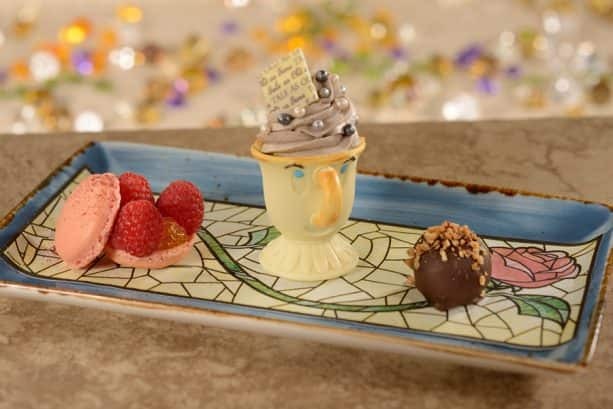 A dessert trio at Be Our Guest? No choice? How will dairy free/egg free/nut free/etc. guests be accommodated? Given that dinner will be a fixed price meal, I hope the alternatives are the equal of the standard dessert and not an afterthought. WOW, will the lace ear headband be on the website or app? Because apparently now the three pairs of headbands I have need this addition to my Disney wardrobe to complete the collection! LOVE the Lemonade Mint Julep Slushy, cannot wait for that along with TWO yummy orange swirls to enjoy and choose from (I’ll take one of each please)! I just love citrus! What can I say, other than MAKE WAY I’M COMING THIS MAY!!! 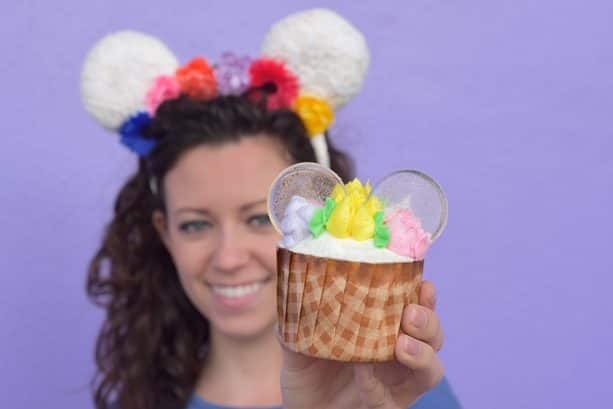 Will the Flower Crown Cupcake be available in May? The original citrus swirl is still available?!?!?! That’s the best news I’ve heard all week. I love the tart-sweet combination, and have decades of fond memories. I’m so glad I can look forward to having it again on my fall trips!